Luis Amado – The Greatest of All Time? Over 50 titles including 9 Spanish Leagues, 6 Spanish Cups, 11 Spanish Super Cups, 4 UEFA Futsal Cups, 6 Intercontinental Cups, 5 UEFA Futsal Euros, 2 World Cups as well as 179 caps for Spain over 14 years, 7 time Best Goalkeeper in the Spanish League and, uniquely for a goalkeeper, Best Player in Spain on one occasion. They are some of the achievements of Luis Amado who has just announced his retirement. I recently met him at the Premier Futsal tournament in India (which he won of course!) and it was great to see him in action. Despite such a distinguished career, his impact on futsal is much greater than the honours he won. As such it raises the debate whether he is the greatest player in the history of the game. In this post I will try to answer that question by looking back at his career, the legacy he has left and what it was that allowed him to achieve such success. 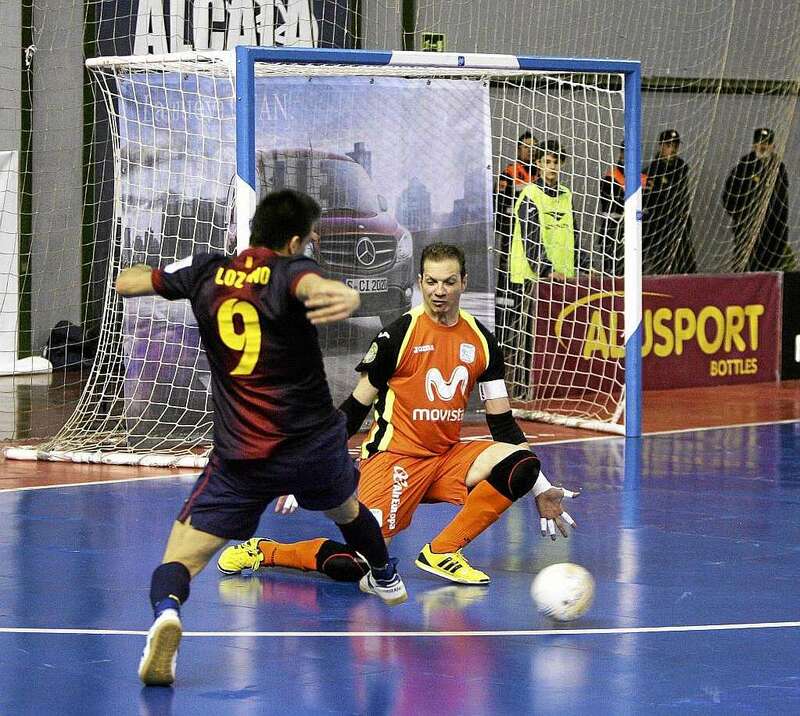 The goalkeeper is widely regarded as the key player in any futsal team. Some quantify this, saying they are 50% or more of the team and I tend to agree. Everyone who has played futsal has experienced a game where they were the far superior team, overcoming the opponent’s defence time and time again only to be stopped by an outstanding goalkeeping performance. A goalkeeper can almost win a game on their own. A great goalkeeper will not only dominate their goal, the dimensions of which are not so large, but their area and further forward. It is no easy task to beat a top goalkeeper even in a 1v1 situation. They are the only player who remains on the court for the full 40 minutes which increases the influence they have. We can see the opportunity the goalkeeper has to impact a game but this is still needs someone with the capability to do it. In the recent history of the game, Amado has had a prominent role. When his journey began in professional futsal in the late 1990s, Spain was still a secondary nation to Brazil and couldn’t overcome this then untouchable world power. He was part of Spain’s rise to the pinnacle of the game, culminating in a World Cup win in 2000, and their ability to remain there ever since. As well as a establishing a successful era at international level, the man known as the ‘octopus’ also helped build the dynasty of Movistar Inter, who have been the clear dominant force of Spanish futsal over the last 15 years. He was an integral part of the Inter side during the middle to end of the last decade that is considered one of the greatest teams ever and earnt the nickname “the green machine”. Throughout this time the club has had many challengers but they are the only one that has remained a constant in competing for the top prizes. The true greats leave a legacy. Many sports stars have won multiple titles but aren’t considered among the greatest. To do this you have to redefine the game like Michael Jordan, Tiger Woods and Roger Federer have accomplished in their respective sports. They create a before and after. 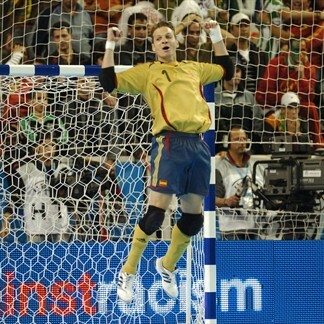 Amado advanced how the position of the goalkeeper is played. There are two schools of goalkeeping. The traditional one has its foundation in Brazil. Their goalkeepers are generally small, agile and quick. They like to dive for the low shots and come sliding out on the knees to close an oncoming attacker. Usually they prefer to wear gloves. The second is the Spanish school which I believe is superior but that can be debated. They are tall, close angles with a cross shape and base their game on positioning. They usually tape the hands rather than wearing gloves. Amado was one of the pioneers of this form of goalkeeping. It can be seen that the history of futsal and futsal goalkeeping itself would be very different today without Luis Amado but he could have easily have taken a different route in life. At around 11 years old he was playing 11-a-side football as a defender, due to his height and strength. The goalkeeper of his team wanted to play out and Amado wasn’t keen on playing outfield so they swapped roles. However, his playing opportunities were limited as his team had a better goalkeeper. He wanted to play and so he went with friends from his neighbourhood to their futsal team. At 15 he began playing in a local league and a few years later he started to stand out. A football team tried to attract him back but he rejected their advances as he had developed a love for futsal. At the age of 18 he was signed by 1st Division Caja Segovia after being identified by a scout at a national championship. However, it wasn’t all plain sailing from there. The sudden jump in standard was too large and alongside a few injuries meant he struggled. He was then being coached by current Kuwait national team coach, Luis Fonseca, who told him he didn’t have a future in futsal and should try another sport. Fortunately for Amado and for futsal, he possessed the self-belief that he could make it in the game. He was loaned to a 2nd division club but the following year his faith in himself would be rewarded. Segovia appointed a new coach, Jesus Candelas, and he needed a back-up goalkeeper. Amado was pencilled in for that role. However, he became the 1st choice that season and performed so well that he was called up by the national team. His club won the Spanish Cup and, the following year, the league with a team that Amado himself describes as a collection of “cast offs”, and the most important trophy in his career. Candelas moved to Movistar Inter and took Amado with him, establishing the club as the number 1 in Spain and the world. I see many similarities in Amado’s story to my own, if a lot less distinguished! So many things had to fall in place for him to reach his goals as well as some luck. No successful person has got to where they are without good fortune. If something as simple as his teammate not wanting to play outfield hadn’t happened, he would have never taken that first step into becoming a world class futsal goalkeeper. I also identify with the ups and downs that are part of any career. A well respected and knowledgeable coach told him he wasn’t even good enough to play futsal! To overcome this needs two things. Firstly, an impenetrable self-belief that deep down you can achieve your goals. Secondly, he needed someone who shared this faith to provide him an opportunity that he could take advantage of. In the end, during setbacks you learn many things that are essential for success. I mention luck and opportunities which makes it seem as if these are just down to chance but this is far from true. Like Amado, in my career I have only had opportunities and been in a position to take advantage of them because I had the necessary determination, work ethic and willingness to make sacrifices. So I have looked at the achievements, legacy and skills of Luis Amado. Human nature means we like to make comparisons and the question inevitably arises; Is he the greatest player in the history of the game? This is a difficult, if not impossible, question to answer when you are trying to evaluate players of different generations and positions. I have been involved in futsal for just over 10 years so have only seen highlights of legends such as Konstantin Eremenko, Paulo Roberto and Manoel Tobias. Also there is a question of how you define the greatest. How do you weigh ability, consistency, longevity, impact, titles, individual awards and performance on the big stage? Each person will have the own criteria. He has changed the game and achieved numerous titles but is he the greatest? He is without doubt one of the top candidates and for me he is the player who has had the biggest impact on his team. Let me know your opinion! 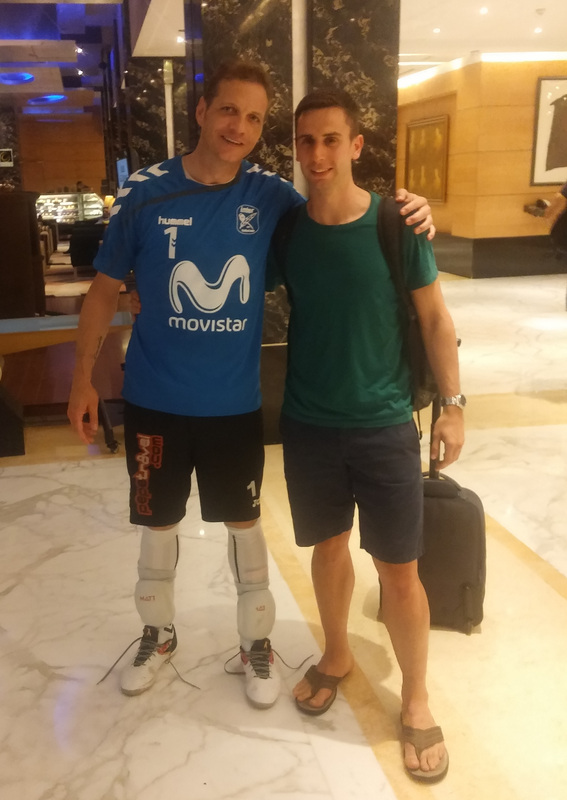 In futsal you have good goalkeepers, fantastic goalkeepers and…Luis Amado!